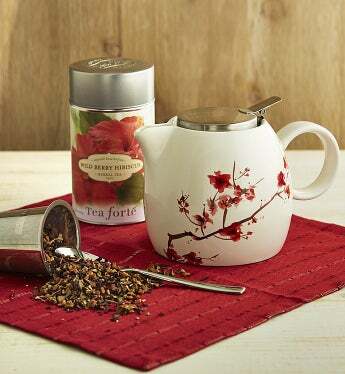 Tea Forte's beautiful and durable, Cherry Blossom gloss-glazed ceramic teapot with its foolproof steeping system will become a lifetime companion to any tea lover. This stunning tea pot is paired with a canister of Organic Wild Berry Hibiscus Herbal Tea, a sweet blend of blackberry, raspberry, apple, orange, and licorice root. Makes approximately 35-50 delicious cups.